Two appendixes: Memorable Passages Quoted by Cicero in On Old Age and an annotated bibliography on Old Age in Literature. Cicero's short dialogues On Old Age and On Friendship once occupied a prominent place in high school and collegiate Latin curricula as intermediate texts and as morally instructive guides for the young. Bolchazy-Carducci has done much to bring them back to the fore by reprinting school texts of both for use in Latin classes. Now G. B. Cobbold's The Red Flare (the title is a phrase from Yeats), an English translation of the former, has appeared in their catalogue to extend the audience beyond language students. Cobbold intends his new translation of Cicero's famous dialogue Cato or On Old Age "to be read by anyone interested in Roman history or ancient philosophy, or reading the Classics in translation" (xxv). He assures a wide audience by leaving nothing for granted in setting up the background of the work. In his introduction he gives a short summary of Roman history from its mythical beginnings to Cicero's own bloody end in the Civil Wars ("Cicero's Place in History") and then effectively and briefly introduces the three characters in the dialogue ("On Old Age"), emphasizing Cicero's imaginative recreation of statesmen long dead by his own time and noting differences between Cicero's method and his model Plato's. An undergraduate student with little to no background in ancient civilization or philosophy will be sufficiently prepared to begin reading the text, if he reads this introduction. Although Cobbold states that he does not intend his translation as a "crib for Latin students," a comparison of his translation with the new edition of the dialogue by J. G. F. Powell in the OCT series (2006) shows that he has been quite faithful to the Latin text. Foremost, he maintains the traditional division of the work into 23 chapters. Occasionally he adds material for the sake of clarity: e.g. he adds the Greek terms symposion and syndeipnon as parallels for the Latin convivium (37), although in the original text Cato notes that the Greeks have two words for the Latin banquet but gives only the very rare terms conpotatio and concenatio. Frequently Cobbold omits consular dates and the names of more obscure figures to smooth the text for the general reader, but he warns the reader explicitly in the introduction that he will do this (xxv-xxvi). The otherwise unknown centurion T. Pontius fittingly becomes "that centurion-what's his name?" (26). Cobbold also sensibly omits discussion of textual questions, such as whether the name of Naevius' play is Lupus or Ludus (p.16); those interested in such will naturally turn to Powell's entry in the Cambridge Classical Texts and Commentaries Series (1988). At the end of the book are three appendices. The first is a "Glossary of Names, Places, and Technical Terms" that elucidates the names and terms that Cobbold admits into his translation. The only possible omission I noticed was one for the Giants, whose war with the gods is referenced in the dialogue (5). The second appendix is a list of "Memorable Passages Quoted by Cicero in On Old Age," which provides the original Latin and Cobbold's translation of quotes from Ennius and other poets; these will probably be of interest only to Latin students. The third appendix, "Old Age in Literature," lists over a dozen works and characters from Shakespeare to the modern day along with short comments by the author. Undergraduate instructors interested in placing the Cato in the context of a course on aging and dying in Western Civilization may gather other possibilities here, and of course the general reader is benefited by reminders of classic works. In short, I recommend Cobbold's translation for classroom and casual use alike, and I hope that soon he will complement The Red Flare with a new translation of Cato's Laelius: perhaps he could title it So Great a Sweetness? Marcus Tullius Cicero (January 3, 106 BC - December 7, 43 BC) was a Roman philosopher, statesman, lawyer, orator, political theorist, consul and constitutionalist. He came from a wealthy municipal family of the equestrian order, and is widely considered one of Rome's greatest orators and prose stylists. His influence on the Latin language was so immense that the subsequent history of prose in not only Latin but European languages up to the 19th century was said to be either a reaction against or a return to his style. Cicero introduced the Romans to the chief schools of Greek philosophy and created a Latin philosophical vocabulary (with neologisms such as humanitas, qualitas, quantitas, and essentia) distinguishing himself as a linguist, translator, and philosopher. 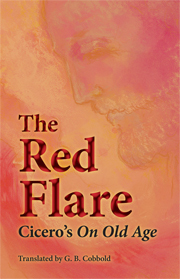 "The Red Flare: Cicero's on Old Age", translated into English by G. B. Cobbold (Assistant headmaster of the Classics Department, Tabor Academy, Marion, Massachusetts) is a 92 page compendium that begins with an introduction that includes a brief framework of Cicero's importance in history, his literary work 'On Old Age', and a note on the translation for an English language readership. This is followed by the translated work itself. Enhanced with the inclusion of a glossary of names, places, and technical terms; memorable passages quoted by Cicero in this work; and 'Old Age in Literature', "The Red Flare: Cicero's on Old Age" is a seminal work of impeccable scholarship, and a strongly recommended addition to academic library Classical Studies reference collections in general, and Cicero Studies supplemental reading lists in particular.